(NaturalNews) Leonardo DiCaprio is one of Hollywood's most celebrated actors, staring in myriad blockbuster films including Titanic, What's Eating Gilbert Grape, The Aviator, The Wolf of Wall Street, The Great Gatsby, The Revenant and many others. Aside from his movies and endless string of model girlfriends, DiCaprio is often in the news for his environmental activism, which evidently, includes traveling the world in a private, fossil fuel-burning jet. 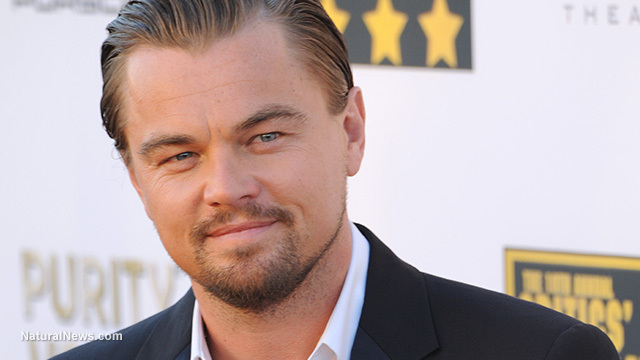 Though DiCaprio's foundation has raised millions for environmental causes, the actor has repeatedly been slammed for his constant use of private jets and yachts. Environmental analyst Robert Rapier noted that DiCaprio's Hollywood lifestyle "diminishes his moral authority to lecture others on reducing their own carbon emissions." The actor received an environmental award in New York City last week, drawing criticism, as he is reported to have flown 8,000 miles in one week despite giving numerous speeches warning about the dire impact of burning fossil fuels. "DiCaprio attended the Cannes Film Festival Monday and was seen partying with model Georgia Fowler. Two days later, The Revenant star was in New York, where he received the Fishermen's Ball's 'Big Fish' award for his commitment to clean water. A day later, DiCaprio was back in France giving a speech at amfAR's Cinema Against AIDS gala," reports Breitbart. The Titanic star recently told the United Nations that "our our planet cannot be saved, unless we leave fossil fuels in the ground, where they belong." He also said that "a massive change is required right now, one that leads to a new collective consciousness, a new collective evolution of the human race, inspired and enabled by a sense of urgency." Clearly, when DiCaprio talks about the need for urgent change, he isn't referring to his own lifestyle habits, but the habits of so-called ordinary citizens. "[He] demonstrates exactly why our consumption of fossil fuels continues to grow. It's because everyone loves the combination of cost and convenience they offer. Alternatives usually require sacrifice of one form or another," Rapier added. "Everybody says, 'I've got a good reason for consuming what I consume' ... It's the exact same rationalization for billions of people." Did you know that 85 percent of the United States' fossil fuel use originates through coal, oil and natural gas? While it provides us with a surplus of energy, it is not without consequences. Global warming alarmists theorize climate change is a direct result of the burning of fossil fuels, contributing to various environmental issues including poor air quality, acid rain and oil spills. Pollution released by fossil-fuel powered plants takes a toll on public health causing illnesses such as asthma, chronic bronchitis, pneumonia, cardiovascular problems and premature death, according to the Scientific American.